Find him on Twitter, Tumblr, Deviantart, Tapastic, Patreon or Gumroad (where you can download comics and sketchbooks). 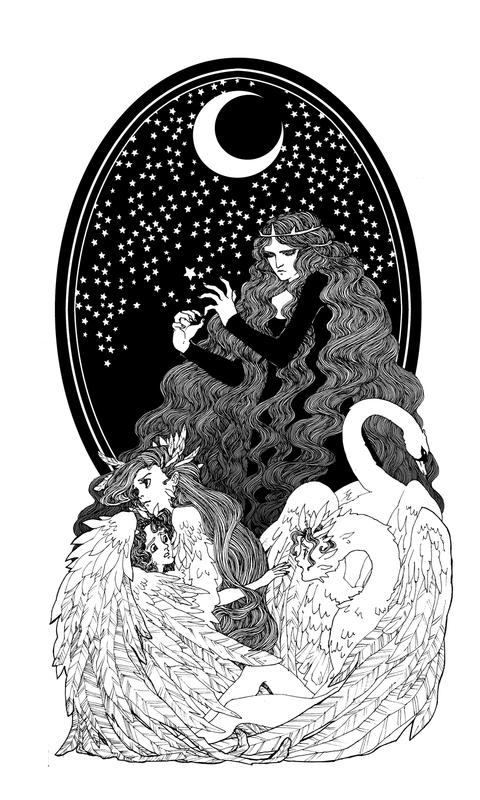 Trungles is a comic artist who I have been following on twitter for a while and admire greatly. Not only is he an incredible artist, but he’s also clearly a person with his heart in the right place and a really spot-on way with words when standing up for what’s right. But let’s specifically talk about his art. Trungle’s pieces merge this inspiration with influence from art nouveau and Alphonse Mucha to create immensely flowing, intricately swirling art that mesmerizes and transforms to a different time, a different world. Like most of my favorite artists in the twittersphere, Trungles seems to love drawing beautiful women–often as fairies, mermaids, or magical girls. His comic, Tamarind, involves a young girl discovering a realm of twelve trapped princesses and a host of secrets. The whole thing is done in ballpoint pen and office supplies. His art varies in color palettes (from ballpoint pen blue to blacks and greys to vivid colors) and some of his portfolio is traditional art, while some is digital. Many of them are fan pieces of everything from Sailor Moon, The Little Mermaid, Digimon, and X-Men to Supernatural, Mega Man, and even Pon and Zi (those cute emo cartoons from the 2000s). And while it seems Trungles has a soft spot for drawing long “noodle” hair on women, he also deviates from this to draw things like these cute merboys in love, as well as people of color and different body types. Even the times when Trungles branches away from the style he is most known for, he creates beautiful pieces capturing humanity in a touching way. All in all, however, what will always draw me to Trungles is the mesmerizing amount of detail he works into each girl he draws, the wistfulness of their eyes and the intricacies of their fabric and flowing hair.